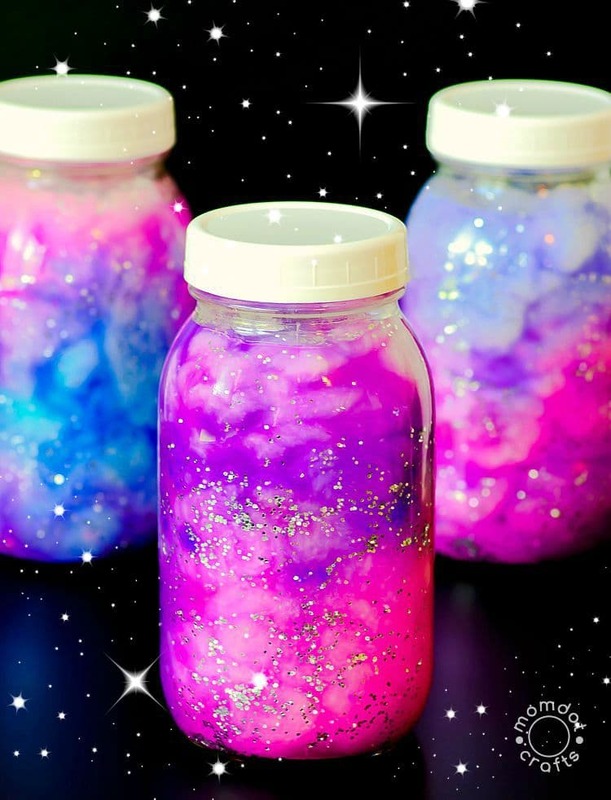 Last year when I made a Galaxy Jar I really struck a nerve with parents. They were looking for something fun, easy, creative, but still with the ability to spark some quiet time with their children. Now that it’s the turn of the year and the holidays are passing slowly, my kids are just starting to resemble the “former” holiday children they usually are. But that doesn’t mean we don’t have our ‘moments’ around here. And somehow my 4 year old has decided to give up his naps 80% of the time. That means by 6pm we are all drawing straws on who has to spend the next two hours getting him to bedtime. 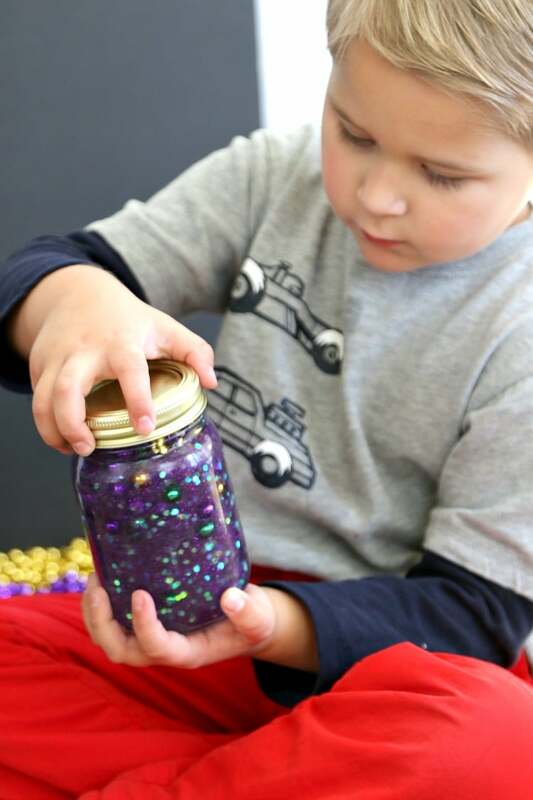 Calming jars a sensory activity that helps children have a moment on the couch to let their mind settle. I can’t remember where I originally saw this idea at to be honest. Its been around so long at this point that it’s like calming jars always were, but with my son now at an age that he can hold a glass jar without danger, I knew it was time to make one and incorporate it into our evening time. For me as a newbie “calming jar” maker, I wasn’t sure the exact recipe that needed to be used. So, as a creator, I figured…let’s just wing it. And that is what we did. 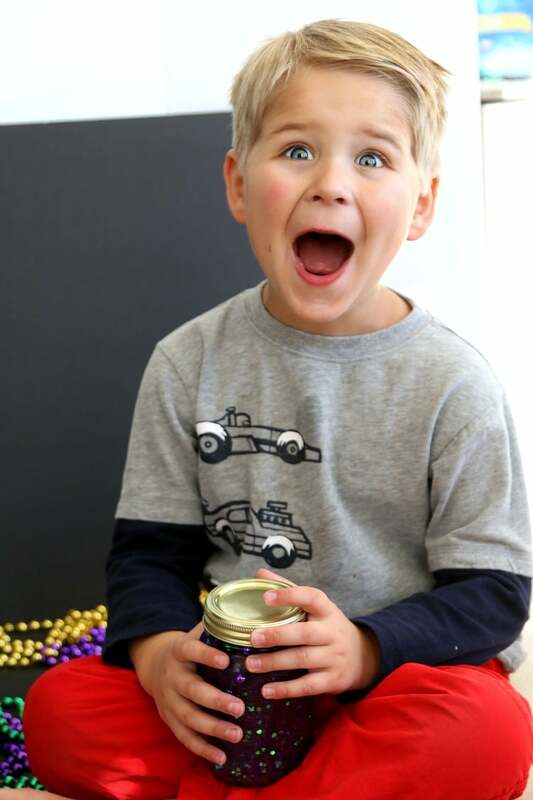 The thing about calm down jars is they are meant to be exploratory. They get you concentrating on what is going on inside the bottle or bag. That means there had to be a “flow” of some sort that wasn’t immediate. We settled on corn syrup alone, corn syrup and water mixed, and clear glue, corn syrup and water. 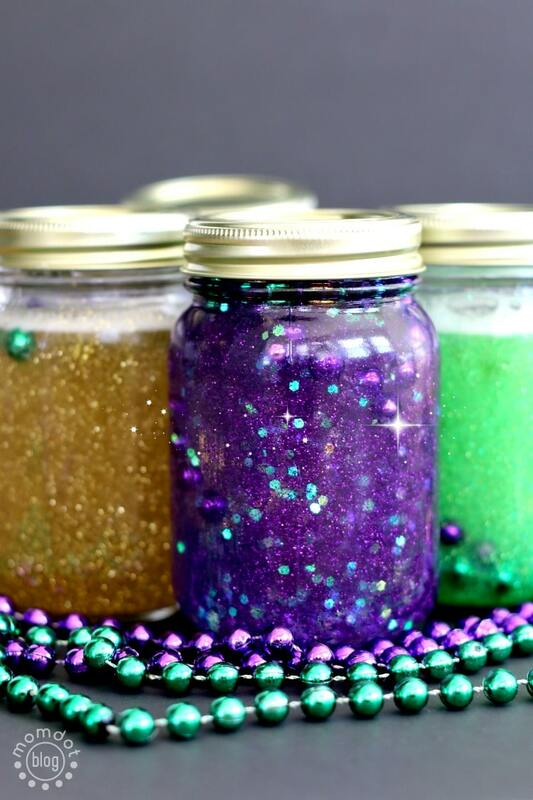 What goes inside a Calming Jar? Now you might want me to give you a very specific measurement to make a calming jar. That’s pretty much impossible as all jars are different shapes and sizes, but what we liked the MOST was half corn syrup and half water. 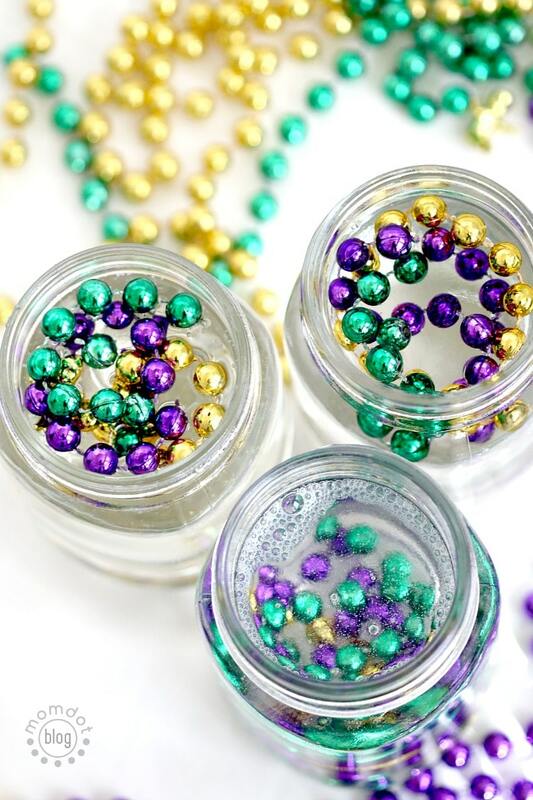 It allowed our beads and babies to fall through the water enough to enjoy but not so fast as it was over in 1 second. If you are so inclined, this is also a fun lesson on viscosity. You can try different liquids – maybe dish soap/water, glue, vegetable oil, baby oil, and corn syrup. It’s pretty fun to see the different ways the items fall down. Tip: We tried a FULL Jar of Corn Syrup….and nothing gets through that so don’t bother. 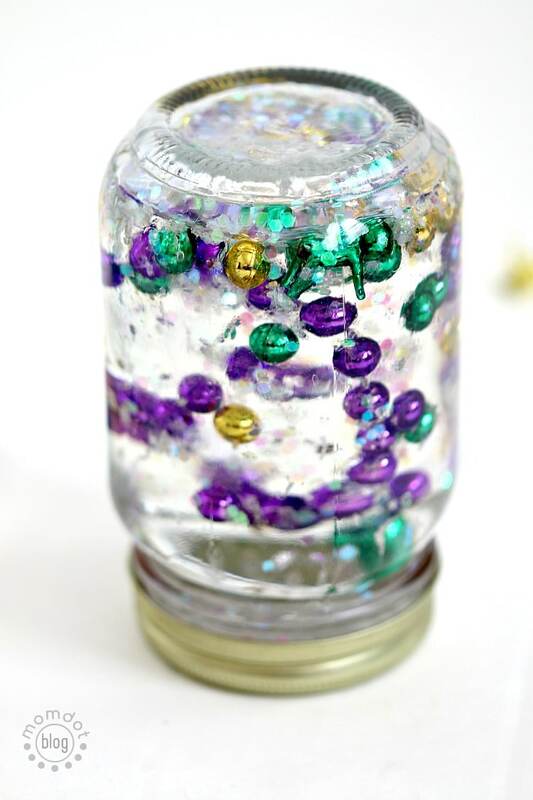 We tried glitter glue (gold), fine glitter (green jar), chunky glitter, and a mixture of glitter glue/fine glitter. Glitter glue sparkles the best in the sunlight. Chunky glitter gave us the best visibility in the water and as we remake, that is what I will stick to. 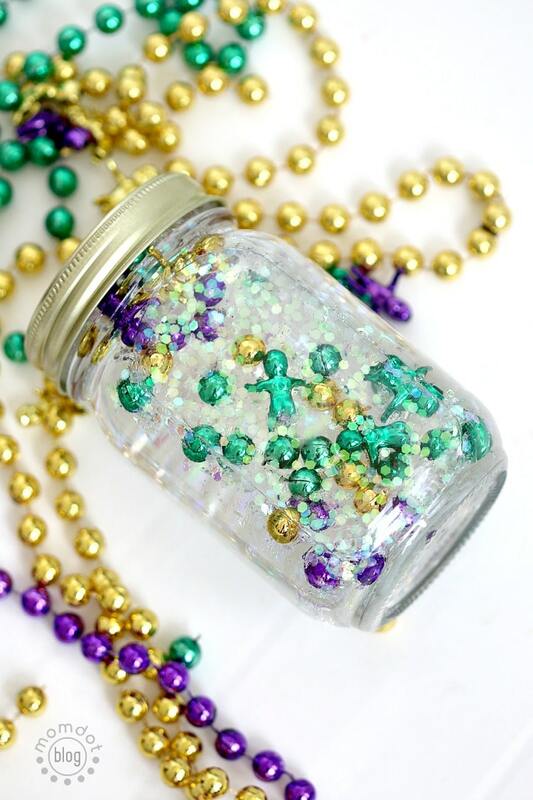 Love this calming jar? 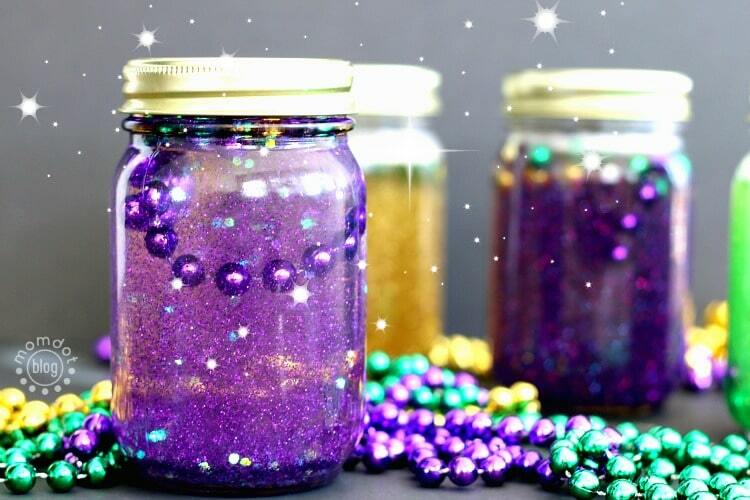 Don’t leave without checking out our Galaxy Jar by clicking below OR visit our entire Crafting Jars Category.